Amazon has the option to create a manual or automatic campaign. While in automatic campaign, Amazon targets the ads automatically, the manual campaigns targeting is decided by the advertiser. Keyword Targeting – With keyword targeting, advertisers can choose keywords for which they wish to display their products in the user search results or the product details page. Product Targeting – With this option advertisers can reach audience while they are browsing (on details page, searching for products, viewing a category) the Amazon platform. In Amazon ads, keyword targeted ads are available with Sponsored Brands and Sponsored Products. 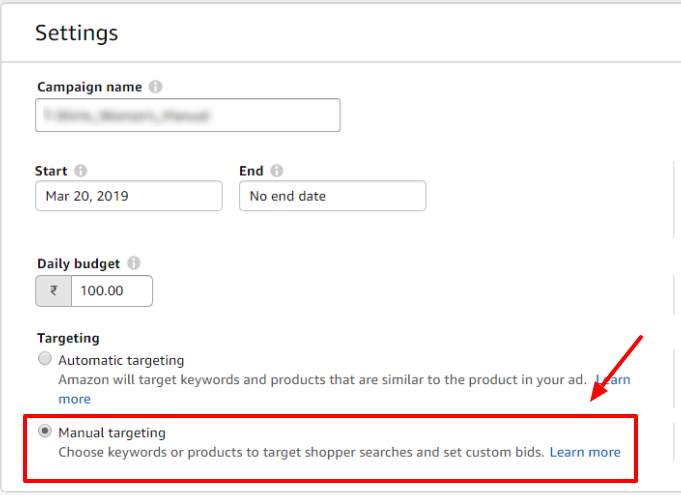 Similarly to other PPC platforms, the keyword targeted ads matches the search terms with the keywords used in the campaign and shows ads if it meets the criteria. How a keyword matches to a user search query, largely depends on the match type assigned to it. Broad Match – The broad match type keyword is matched to a user’s search term if all the keywords are present in it. It is least restrictive of all the match types, as it matches with a wider range of search terms and reaches out to a more larger audience comparatively. Phrase Match – The phrase match type keyword is matched to a user’s search term if the keywords are present in the same order. Exact Match – The exact match type keyword is matched to user’s search terms if it is an exact match of the keyword. It is the most restrictive form of the match type as it matches with only select search terms. For more insight into Keywords match types click here. How To Add Keywords To Amazon Ads? Step 3: In the Following page, select Manual Targeting. With this step you have completed the process of creating your campaign. 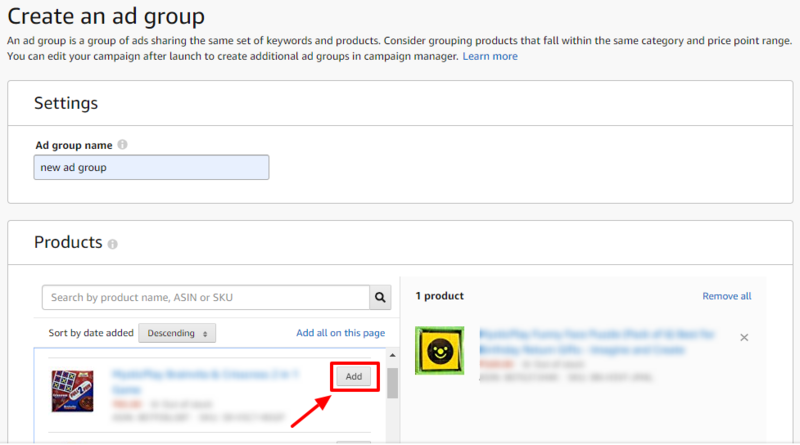 Step 4: In the next step, create your ad group and add the products that you wish to target. Once selected you are ready to get started with your campaign. You can, at any point, come back to the campaign and add more keywords to it, if required. 1. Use Search Query Data For Insight – When starting with a new campaign, you might have to stick with a broader terms as there isn’t enough data available to run an analysis on which terms to bid for. Once your campaign drives some traction, download the search terms report and find the terms that you can now aggressively bid for. 2. Create Automatic Campaign For Data – Sponsored Products has the option of a manual or automatic campaign. You can initiate an automatic campaign, gather substantial data and use the terms found from this campaign in a manual campaign, where again you can bid more strategically. 3. Add Negative Keywords – To ensure that you campaigns are driving relevant traffic to your business, include the irrelevant terms as negative keywords. This reduces your budget from getting wasted on unwanted clicks and you can instead, focus on traffic that are converting. 4. Using Match Types Properly – An ideal keyword strategy is to first add all search terms with lowest ACoS and a decent volume, as Exact Match Type. Then find broader themes that cover most of the search queries that convert and add them as Phrase and/or Broad Match Type. 5. Tweak Bids – Bid wisely by reviewing the ACoS of your keywords. Consider reducing the bids of keywords with High ACoS and observe the results to further decide on lowering it or not. For keywords with low ACoS, consider increasing the bids to determine if that impacts its performance positively. 6. Don’t Forget Your Product Listings – Using keywords even in your product listings, makes your ad more relevant and instills a positive user experience. 7. Use Long Tail Keywords – You can make your ads reach relevant audience by adding Long Tail Keywords. These are keywords with a combination of three or more words. Using long tail keywords can help you reach audience with a very specific intent. So, instead of showing your ads for someone searching for shoes, you can instead make the user reach your precise product for a search term such as white running shoes for men And its worth mentioning that these keywords have a higher probability of converting. 8. Brand Terms Bidding – Don’t forget to bid on your brand terms and also that of the competitor’s. This will ensure that you don’t miss out converting the customers who are already aware of your brand and the one’s who are aware of your competitor’s. Our negative keywords tool for Amazon Ads provides superior n-gram based recommendations. We are the first tool to support shared negative lists for Amazon Ads. Learn more and sign up today to improve your ACoS with the cutting edge tools.